Leiden as a city evolved along the banks of the river Rhine, where the fortress had been built and the counts had also settled. Walking along Leidens many canals and almshouses the guide will sketch an image of the Golden Age in which the majority of the people depended on the cloth industry and these goods were shipped the world over; a time when Dutch painters flourished and Leiden university was founded. In short: Leiden is well worth such a tour. 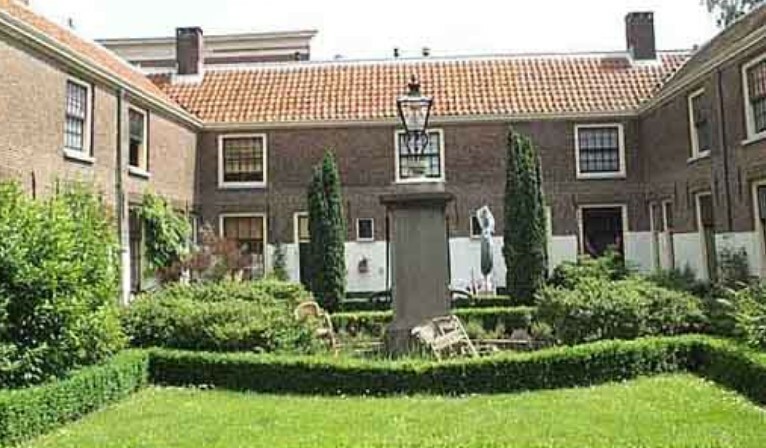 This tour leads you through Rembrandt’s Leiden life. The Guide starts at the Stadstimmerwerf (The old construction Wharf) and together you walk past the artist’s place of birth as well as other noteworthy spots showing you what influenced Rembrandt’s early life before he definitely settled as a painter in Amsterdam. The walk ends in the centre of town where we can still see the house where this famous Dutch artist had his first painting lessons. The Boerhaave walk through the old town. 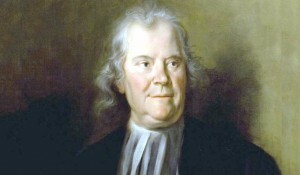 Boerhaave was one of the most distinguished and learned medical doctor of his time. Even today we are still indebted to him for a great deal of knowledge that this famous academic passed on. 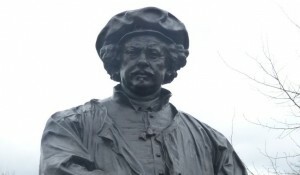 His whole life Boerhaave was connected to Leiden University and many buildings in town are related to his former activities. This walk follows in Boerhaave’s footsteps, recounting what he did and whom he met in his life time. Starting point is in front of the Waag (Weighing House) at the Aalmarkt. In 1608 a group of English Separatists persecuted by King James I, fled from England to the Republic of the Netherlands and came via Amsterdam to the calmer city of Leiden in 1609. In 1620 the first group left and finally arrived in America on the “Mayflower”. 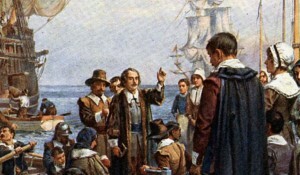 The Pilgrim Fathers, as they are called, are considered the founders of the United States. In their ancestors’ tracks many of their descendants still come to pay the town of Leiden a visit. The guide will tell you about their life in Leiden and show you some of the places they frequented. Around 1890 an art style evolved in a number of European towns which was foremost a reaction to the neo-styles of the 19th century. Inspired by the arts and crafts movement in Britain this new art form influenced different artists in Austria, Germany and the Netherlands to form the Jugendstil movement while its reverberations in France and Belgium lead to the more fluid Art Nouveau style there. 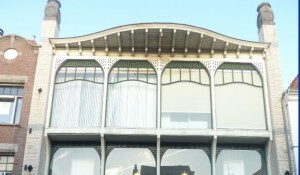 Its experimental and typical architecture introduced the available new materials and techniques such as the iron skeleton construction using large glass surfaces for shop windows for the first time. This Jugendstil tour offers you a varied impression of the remnants of that ‘new art’ form in our town of Leiden. 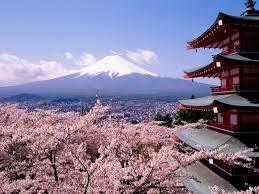 In 1609 the Dutch received official permission to establish a trading post in Japan. At first in Hirado and later in Decima, an artificial island in the Nagasaki bay. From 1640 till 1853 the Dutch were the only foreigners allowed to have trade relations with Japan. Several places in Leiden remind us of this special relationship with Japan. This city walk (approximately 2 hours) is dedicated to the relationship between the Netherlands and Japan, in which Leiden always played its own special role. Moreover, attention will be paid to 3 Japanese poems painted on Leiden walls, among which a Basho haiku. 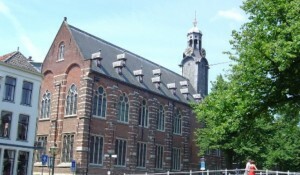 This tour reflects the intimate relationship that Leiden has always had with its University. The guide sets out at the Synagogue at the Garenmarkt and takes you to the Kamerlingh Onnes Laboratory where in the world of Physics and Chemistry history was written. This building is situated where the Gunpowder ship exploded in 1807. The walk continues past the Academy building and the Botanical gardens and you will also visit some almshouses.